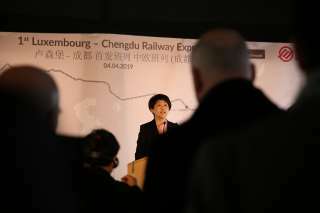 In the presence of Yin Li, Governor of the Sichuan Province, and Félix Braz, in replacement of the Minister for Mobility and Public Works of Luxembourg, François Bausch, as well as shippers and logistics service providers, the train departs from Bettembourg-Dudelange Intermodal Terminal towards Chengdu Qingbaijiang International Railway Port. The train will cross Germany, Poland, Belarus, Russia and Kazakhstan, entering the Chinese territory in Alashankou and will finally arrive at the Chengdu Qingbaijiang International Railway Port in only 15 days. 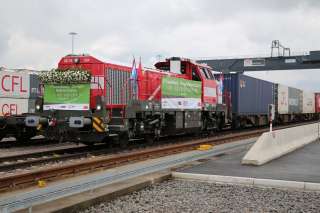 With this new connection, the Intermodal Terminal of Bettembourg-Dudelange contributes to strengthen the intermodal offer between Europe and China, as a consolidation hub for South Western Europe. Simultaneously, Chengdu International Railway Services (CDIRS) improves further its coverage in the hinterlands of Europe as well as its service quality. Félix Braz said: "I am extremely pleased to witness today's launch of the new freight rail connection. It is the result of long discussions with different Chinese partners and certainly a huge milestone in Luxembourg's railway history as well as the partnership between China and Europe. In the name of the Luxembourgish Government, I would like to extend my thanks to all concerned for their fruitful cooperation; I am sure the project will be a huge success." Yin Li said: "Today, the train will travel nearly ten thousand kilometers across Europe and Asia, carrying goods representing the friendship between people from Luxembourg and China to Chengdu Qingbaijiang International Railway Port. I hereby address my most sincere gratitude to all parties involved in propelling the materialization of Luxembourg – Sino Belt and Road collaboration, as well as to those who have contributed to strengthen the relationship between the two countries. 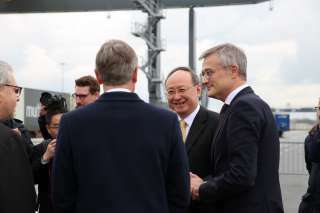 I would also like to address special credit to CFL multimodal, and to all the other Luxembourgish and Chinese companies who have contributed to the opening of this rail freight connection." The train inaugurated today carries 41 containers loaded with food, medical equipment, electronics, hardware, ceramics, daily consumer goods, etc. Located on the Rail Freight Corridor 2 and at the crossroads of the North-South and East-West routes, the Intermodal Terminal of Bettembourg-Dudelange is ideally positioned to act as an international hub for the consolidation of multimodal transport flows between South Western Europe and China. With daily combined train shuttles to major European economic centres, CFL multimodal is constantly striving to develop and enhance its multimodal service offering. From 31 trains launched in 2013 to 1.595 trains in 2018, Chengdu has been topping the EU – China rail platform companies for the 3rd consecutive year. Chengdu's high-paced development has proven the wide support and acceptance of the Belt and Road initiative in the relevant countries along the road, reflecting these countries' acknowledgement of the slogan "peaceful cooperation, openness and inclusiveness, reciprocity and mutual benefit" proposed in the New Silk spirit, and their consensus for the construction of a community with a shared future for mankind. The inaugural run between Luxembourg and Chengdu serves as a good start. CFL multimodal and CDIRS have commonly expressed the intention to optimize the operations and set-up a regular connexion in both directions in the coming weeks. Both parties will also ensure the implementation of the agreements reached between the two countries. The Luxembourg-Chengdu Railway Express will contribute to foster the cooperation between Europe and China, to enrich the Luxembourg – Sino friendship, and to promote the development of Luxembourg, China and all the other countries and regions along the road.